Earlier this month, our leadership team met in Austin for quarterly strategic meetings that focused on growth and the future of our practice. One of the main topics of discussion was the trend toward smaller, more dense urban residential development projects. 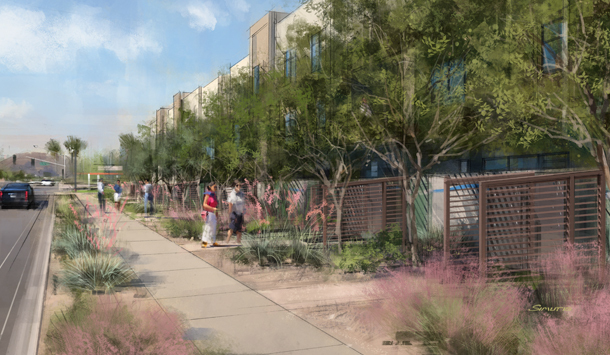 This shift was recently exemplified in an Arizona Republic article about iconic Arizona developer and longtime client DMB’s pivot away from the suburbs and toward urban infill. Developers like DMB are responding to a variety of market forces, including changing demographics, homebuyer preferences, the current state of the economic recovery, and desired return on investment time from a development perspective. Now that RVi and LVA have joined forces, it is even more apparent how our strengths and experience complement one another in this changing market. Both firms have been on the forefront of residential planning and design since the earliest master planned communities emerged in the 1980s and before, with projects ranging in size from the 43,000-acre Coyote Springs master planned community in Nevada, to Mueller, a 700-acre new urbanist development in Austin, to the 6.8 acre, 81 unit Aire on McDowell urban infill development in Scottsdale, AZ. Each of these projects has its own unique identity and place in the market, and each required a different approach to achieving success. In this article, we will explore 3 important considerations when approaching urban infill development. The more urban the context, the more complex the entitlements process can become. It is critical to work with a planning firm that understands local codes and ordinances and has a strong grasp of more compact, urban requirements such as narrower streets, building height transitions, bulk regulations such as setbacks, lot coverage, and size and scale of open spaces. Many municipalities have development standards in place that are based on traditional suburban development, and their existing codes and ordinances may not be well-suited for urban infill. In these cases, having a land planner that understands both suburban development as well as urban infill can be helpful when interpreting the existing rules and working with city staff, politicians, and community residents to craft new standards that provide community protections but also allow for desirable, compact urban development. When a change of use is proposed for any property – urban or suburban – working with the neighbors of the site is always a key consideration. As developments become more urban, the size, diversity, and complexity of neighborhood concerns tend to increase. RVi is particularly skilled at navigating this delicate process, which often involves educating stakeholders about impacts to property values, quality of life enhancements, traffic impacts and traffic mitigation, aesthetics, public spaces, and impacts to adjacent properties. Our approach is to engage the stakeholder community early and often, with techniques that range from public meetings with hundreds of attendees to one-on-one meetings at the kitchen table of a concerned neighbor. The key to success is listening, educating, and creating a plan that fits into the fabric of the existing community. 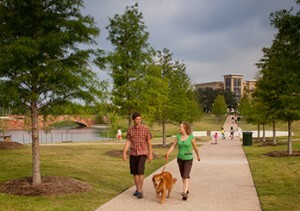 Plans that respond to stakeholder input often involve transitioning building heights and orienting buildings and vegetation to maintain privacy and/or existing viewsheds, screening uses with strategically placed landscape material, and creating public spaces and amenities that benefit the overall community. At RVi, we believe that community is not something that can be designed, but rather something that is enabled through good design. Community is the result of the interactions of many different people who share a space. It is our job as planners and designers to carefully consider all of the physical elements that can come together to create community. In the urban environment, this includes consideration of public and private amenities, accessibility of public spaces, pedestrian connectivity, relationship to the street and adjacent properties, theming and branding, and much more. Our goal is to get these physical elements to work together in harmony, creating a space that achieves the project goals but also brings value to the community as a whole.